As a Red-Sox-cheering, New-York-Yankees-hating Rhode Islander, baseball and roasted peanuts have long been a part of my history. 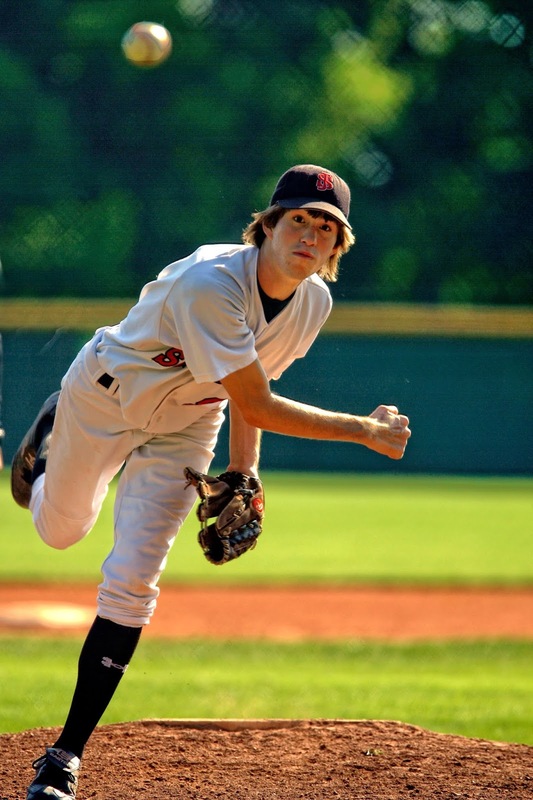 Baseball was king in the little harbor town where I grew up. Many a night I'd fall asleep to the sounds of late game broadcasts from Fenway Park. When we couldn’t catch a game on TV, we’d feed our insatiable appetites by cheering for the VFW team in the field across from our house and eating sacks of roasted peanuts. In ninth grade, I was in luuuuv with #16, the cute second baseman with shaggy hair and a shy smile. I don’t know if he could hear us cheering for him from the stands, but I imagined he could. When the other team was at bat, my friends and I would climb down from the bleachers, buy a cup of Del’s Frozen Lemonade and a bag of roasted peanuts from the concession stand and return to our seats, leaving a trail of peanut shells behind us. The heavenly trifecta of hot, salty, and crunchy made roasted peanuts the baseball food of the gods. Then I moved to the South. Far, far away from #16, baseball, and roasted peanuts. I thought things were looking up the day we visited my Aunt Leila in the tiny town of Sandy Run, South Carolina. Uncles, aunts, and cousins had gathered for the annual pig pickin’ (my first) and to welcome their long-lost family members back home. Standing awkwardly in the kitchen making small talk with a cousin, I glanced around the room. There in the center of the wooden picnic table was a bowl of peanuts. I grabbed one, split its shell, and popped the peanuts into my mouth. But instead of the hot, crunchy goodness I expected, something cold and slimy hit the back of my tongue, activated my gag reflex, and launched the offending legume from my mouth. Whooah, I thought, that was a bad peanut. I grabbed another, split its shell, and tossed the nuts into my mouth. Like a recurring nightmare, the slimy pellets crossed my tongue and headed toward the back of my throat until a mighty heave sent them back from whence they’d come. Yuck! Must have been a bad batch. Like a detective at a crime scene, I approached the bowl a third time – slowly. And saw what I’d missed on the previous two encounters. Instead of parched white shells, these peanuts had wet brown ones. They were soft and slimy, too. I pressed the seam that ran the length of the nut. Cold brine squished out and ran down my wrist. Instead of dry, confetti paper skins that crumbled beneath my touch, these skins were stuck to the nuts like a wet diaper to a baby’s bottom. Underneath the brown wrapper, the peanuts were pale and shriveled. What, in heaven’s name, was wrong with these peanuts? I’ve since learned that while boiled peanuts and roasted peanuts are cousins, they’re not kissing cousins. As different as the city mouse and the country mouse, the two bear little resemblance to each other. 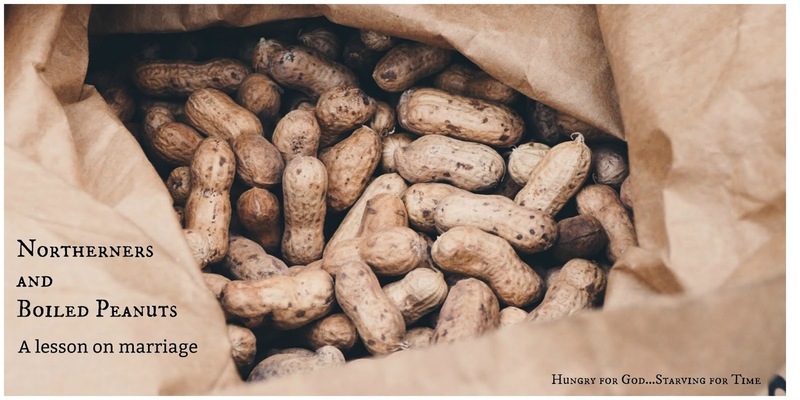 It took me three attempts on three different occasions to develop a taste for boiled peanuts. In the process, I discovered an important principle about marriage. It’s all a matter of expectations. When I expected boiled peanuts to taste like roasted peanuts, I was disappointed (and disgusted) every time. Once I set aside my expectation of how a peanut should taste, I was free to accept (and even appreciate) the other varieties of peanuts. In this case, a boiled peanut, not a roasted one. After almost 35 years of marriage, I’m still learning to value the unique qualities of my husband. 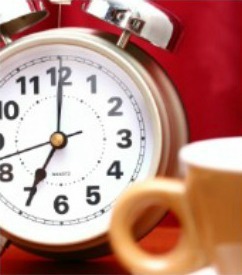 Instead of expecting him to be quick and decisive, I’m learning to appreciate him as patient and methodical. Instead of expecting him to be serious, introspective, and task-oriented, I’m learning to appreciate him as fun-loving, carefree, and people-oriented. 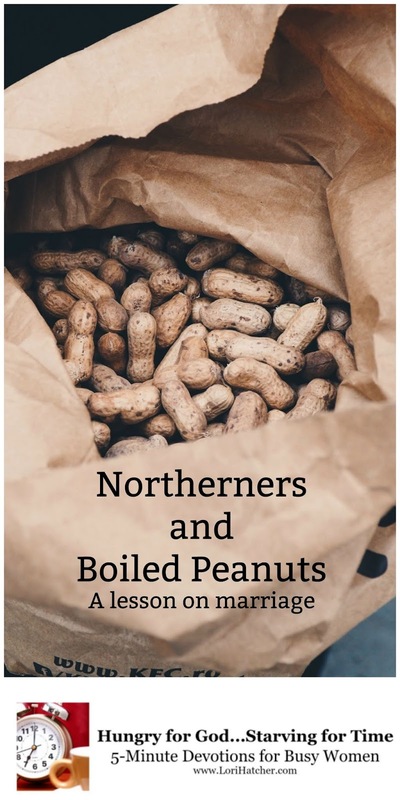 Accepting my husband as a boiled peanut instead of expecting him to be a roasted peanut frees me to enjoy the unique person God has created him to be. This helps me cherish (not just tolerate) him. As we cherish each other, we pave the way for contentment. Contentment fosters an environment of love and mutual admiration. When we love and affirm each other, we position ourselves to become all God wants us to be. This is one of the beautiful parts of marriage. And now, back to peanuts. A few weeks ago my husband and I ate at Five Guys. Waiting for our burgers, he noticed a bin of roasted peanuts and a sign that said Please enjoy a snack while you wait. “Would you like some?” he asked. Now it’s your turn. What characteristic about your husband have you learned to appreciate over the years? How has that changed how you think about him? Leave a comment below and share your story. If you’re reading by email, click HERE to visit Hungry for God online and leave a comment. Lori, I'm a southerner but I don't like boiled peanuts, either. I want the roasted ones, too! I had never had a boiled peanut until I moved to Georgia in the mid nineties (and yes, they are slimy, ugh!). I prefer the roasted ones I grew up on in Arkansas. Great analogy, Lori! Bahaha. THat makes me laugh :) Truth be told, I might not have ever mentioned #16 to him. . . shhhhh. 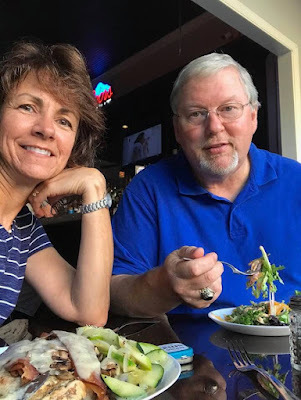 My husband and I celebrated our 40th wedding anniversary on March 3, 2019. Over the years, I have learned to let him "adjust" my recipes to his liking. Funny thing is I tell him, "You have cooked so much and now you are the family cook instead of me." haha! We grow more in love every day.